Is Automation the Key to Optimizing Your Pharmacy's Efficiency? Why Purchase Custom Retail Displays? Are You Effectively Utilizing Your Gondola Shelving? Why Choose Madix Shelving Products? Is Your Pharmacy Workflow Killing Your Productivity? Wood or Metal Shelving for Retail? Should You Go for a Glass Display Showcase? Retail Store Shelving: What Comes First? Can Pharmacy Rx Shelving Help You Meet Privacy Requirements? Combination Versus Traditional Floor Plan: How to Choose. Is a Traditional Pharmacy Floor Plan Right for You? 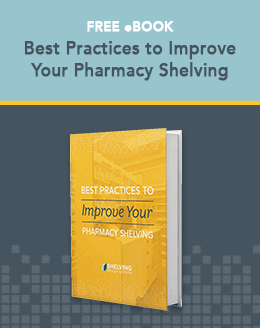 Pharmacy Shelving: Custom, Mid-Range or Basic? Retail Shelving: When is Basic Okay? Why is Pharmacy Workflow So Important? Pharmacy Remodeling: When Is the Right Time? Does Pharmacy Workflow Automation Save Money? What Does It Really Cost to Start a Pharmacy? Does Your Store Need a Customer Gathering Place? Is Your Pharmacy Layout Driving Your Customers Crazy? HIPAA and Your Checkout Counters: Is It a Match? Is There a Science to Merchandising My Pharmacy's Front End? What's the Benefit of Using a Plan-A-Gram to Design My Pharmacy? If You've Got It (Pharmacy Merchandise), Flaunt It! How Do Coffee and Soda Fountains Relate to My Pharmacy? Do You Really Want Someone Else's Dirt in Your Store? Custom Millwork: What Is It, and Why Should I Care? What Does a Typical Pharmacy Shelving Vendor Offer? What Impact do HIPAA Laws Have on Pharmacy Construction? What Does Pharmacy Workflow Have to do with Customer Reviews? Can Your Retail Shelving Layout Help Loss Prevention? Electronic Prescribing: What Is It and How Will It Affect Pharmacy Management? The Affordable Care Act and Expanded Pharmacy Services: Are You Prepared? New Styles, New Features: What's Different About Retail Shelving Today? Is Your Pharmacy Layout Modern Enough? Is Your Pharmacy Layout Done with Your Customers' Best Interests in Mind? Why Show the World a Completed Retail Shelving Project? Why Show the World a Completed Pharmacy Shelving Project? How Pharmacy Design Improves Customer Experience and Profits!